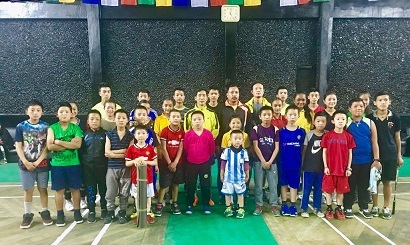 A free summer badminton coaching camp themed “Catch them Young,” particularly meant for the children in the age group of 6 to 15 years was recently launched at Multi Indoor Sports Club in Bomdila under West Kameng district. Organized by the West Kameng District Badminton Association (WKDBA) under the supervision of Arunachal State Badminton Association (ASBA), the two-month long camp aims to promote indoor games, particularly badminton in the state of Arunachal Pradesh. “Going by the theme, the camp also looks at ‘catching the players’ young and providing them with all the required facilities and training in order to bring the best out of them for representing the state in the national and international levels,” informed ASBA executive member Aju Khonjuju who has been supervising the camp on behalf of the association. “The modules for the coaching have been designed in accordance with latest Badminton World Federation and Badminton Association of India standards to suit the young kids,” Khonjuju added. Meanwhile, the president and general secretary of WKDBA have extended their gratitude to Home Minister Kumar Waii for providing a coach for the said camp and ASBA chairman Techi Ratu and secretary Bamang Tago for their support and coordination to conduct the camp. Around 40 girls and boys are taking part in the summer badminton camp which is being supervised by experience and professional badminton coach K B Gurung.